Face it, Max was useless. He dropped out of college cause he didn't like it then he wanted to skip going to the war? Yeah okay, that makes sense. And he got sent home all cause he got a bump on the head, when there's real soldiers who lost legs or arms? I used to like him, before realizing what useless loser he was. And his accent was crap, you're not american, your british! But I do like this film, listening to the soundtrack right now, I have two, the original one disc one and a two disc one! Love the movie. Thought it was great. Love the actors and actress. They made it so believeable. OUTSTANDING, INCREDIBLE! ONE OF THE BEST MOVIES THAT I HAVE EVER SEEN! CAN'T WAIT FOR ANYTHING OF HERS IN THE FUTURE. I do not know how I missed this movie in theaters. I am currently watching it on Cable TV (Encore). I have watched it and embraced it over 20 times so far and will continue to do so as long as it is available. For any critic who did not rate this movies favorably, you have to have no emotion or sense of what you are criticizing. There is sooooo much garbage in movies now, that the critics really have nothing to rate. Julie Tremor is fantastic. Witness The Lion King on Broadway. Forget Spider Man on Broadway. 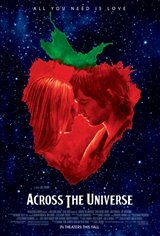 Do Across The Universe. What an accomplishment that would be. Truly a winner, Vegas show LOVE could use your help. They need somebody. Best and most creative movie I've seen a very looooonnnng time. A rare gem - the one four leaf clover in a sea of green... I just watched it and want to watch it again right now!!!! I've wanted to watch it since I heard about it while surfing the internet. I thought it was a great concept of a movie. And. Yaaaaay. The movie didn't disappoint me. I quite loved it. It made me very happy, and I loved singing along to all the songs. After reading the reviews, I almost didn't want to watch it, but. Mmm. I'm glad I don't listen to these moronic negative reviews that give no reason /why/ they think the movie's bad. So. Whoooo. Great movie. Recommended for anyone who enjoys musicals, or a movie with an interesting story. AMAZING. I have gone 5 times in theatres. Such a good movie, cute, funny, and you get attached to the characters! WORTH SEEING. best movie out in ages. Excellent! The singing and songs were even better than the actual beatles! Can't wait til it's on DVD. And I ran out and bought the soundtrack as soon as the theatre let out. Worth seeing again and again! I absolutly loved this movie. I saw it twice in theatres and I am very excited to buy it on dvd! Cheesey garbage with some of the worst covers of Beatles tunes you'll ever hear! Skip it and see "Help!" instead; you'll be much better off. i thought this movie was something off the norm and enjoyed watching it. the part with mr kite was really the only part i didn't care for, and wasn't needed in the movie. one star is generous. zero plot strung between 30 music videos. if you want beattles music, listen to a cd. awful. it is a rare movie that makes you angry, and this is one of them. The best movie I've seen in a long time. I can truly say I have never seen a more innovative, satisfying movie. The music, all Beatle tunes from early 60's to the 70's was unbelievable. I'll see it again. I wish I had three thumbs.. so they could all be down. Awful ! Based on reviews, I was sceptical when I first walked into the theatre and I'm incredibly glad that my worries were laid to rest pretty fast. From the opening scene with Jim Sturgess singing "Girl" in a quiet, haunting way I was riveted. The songs chosen were fantastic and there were even a few more obscure tracks thrown in, which was refreshing to see. The film IS fairly long and the plot jumps around a fair amount, but ultimately, the talented voices of the actors and the interesting nature of the subject matter kept me riveted. A great retrospective on Vietnam-era America and the clashing cultures that made it such a tumultuous time. Cameos from Eddie Izzard, Bono and Joe Cocker, too! An excellent musical based on the songs of the Beatles. All the cast are strong singers and a few cameos including Joe Cocker, Eddie Izzard, and Bono. Great fun! Seriouslli. Greatt go see it! Best movie since " Pink Floyd The Wall" definitely recommend this movie to and anyone who lived during this time period and anyone today. Amazing movie . Best one i've ever seen . deserves 5 stars. Loved it! What a beautiful story with an awesome soundtrack. Being of the "older crowd" my friend and I loved this movie. The music was very good....reminded us of "Rent", and the story was interesting. It covered a lot of history. I was a little worried in the opening half hour. Seemed a little corny but it got GREAT. Was sad to see it end. There are not too many movies that I have been able to say that about. Go see it- it is terrific. Excellent movie - specially if you love Beatle music. every song fit perfectly in the movie. BEST (Drama/Musical) MOVIE OF 2007! i absolutly loved this movie. couldn't get it out of my head for days it was brilliant. as for people who give bad reviews on movies why would you even look at something to do with a movie you didn't like? A perfectly captured trip without the use of hallucinogenics. The writing and directing was brilliant, as were the performances. I'm not a huge Beatles fan, nor am I a fan of musicals. At first I felt like leaving, but it caught my attention long enough to keep me sitting and find out what would happen next. For those who thought this was just a love story, I'm sorry, but you totally missed the point. An important part of history captured brilliantly on film. Not a fan of musicals, but this one was pretty sweet! It made me really want to try drugs because of all the wicked visuals. The story's pretty easy to follow. I don't see how people are so shocked and disgusted with this movie in all the previews it looks like a lot of drug trips so I'm not sure what they were expeting. Maybe this movie's just too deep for them to understand. It was really cool. Highly recommend!!!!!! This is one of those movies that you either REALLY love or Really hate..thers no really grey areas. i personally loved this movie..i guess part of that is because i'm a woman and it was kind of a chick flick. still 5 *!! AMAZING MOVIE!!! Yes it was cheesy, but I loved it!!!! I loved the songs and the choregraphy!!! That was amazing!!! GREAT JOB!! it was actually amazing, best movie ive seen in a while. What a waste of film, what a waste of my time. Ya sure it’s visual and it has a good sounds track (can’t go wrong with the Beatles) but no story to it at all. I got to see it for free but I think I should have been paid to see it!